Tag line: "The End of the World Starts at Midnight"
Before it reached the five-minute mark, Fred Dekker’s The Monster Squad already had me smiling ear to ear. Opening 100 years in the past, the movie takes us to the castle of Count Dracula, and as the camera moves through the darkened, shadowy halls of his terrifying abode, we notice a few armadillos are scurrying about on the ground. These same creatures also showed up in 1931’s Dracula, and, even today, their appearance in that film has fans scratching their heads. Though native to the Americas (most originate in South America, but a few species made their way to the United States), these bizarre rodents suddenly, and inexplicably, turn up in Transylvania, crawling around while Bela Lugosi gives Dwight Frye a tour of his castle. The moment I saw them in The Monster Squad, I knew that the creative minds behind it share my love for black and white horror. In 1931’s Dracula, armadillos seemed out of place, but in The Monster Squad, their inclusion was just about perfect. Legend has it that, every 100 years or so, a seemingly indestructible amulet, the source of all that’s good in the universe, becomes temporarily vulnerable. Should it be destroyed during this brief window of time, the powers of evil would immediately take control of the earth. A century earlier, Dr. Abraham Van Helsing (Jack Gwillim) managed to keep the amulet from falling into the hands of the sinister Count Dracula (Duncan Regehr), who would have smashed it the first chance he got. It’s been about 100 years since this occurred, meaning the amulet is once again in great danger. To ensure it remained safe, Van Helsing’s followers hid it somewhere in the United States. But Count Dracula has tracked it down, and not willing to take any chances, he’s brought a few of his “friends”, aka Frankenstein’s Monster (Tom Noonan), The Wolfman (Carl Thibault), the Mummy (Michael Reid MacKay) and the Gillman (Tom Woodruff Jr.), along to help him destroy the amulet once and for all. Who can stop the Count and his fiendish crew? Why, The Monster Squad, of course! Having answered the call to arms, The Monster Squad is prepared to defend the amulet at all costs… provided their mothers don’t call them in for dinner first. See, the members of The Monster Squad: Sean (Andre Gower), Patrick (Robby Kiger), Horace, aka “Fat Kid” (Brent Chalem), Eugene (Michael Faustino) and newest member Rudy (Ryan Lambert); are all pre-teens with a passion for horror movies. But don’t let their size fool you: when it comes to fighting monsters, this squad is second to none! Thanks to the antics of its adolescent cast, kids are sure to get a kick out of The Monster Squad, but that doesn’t mean it won’t give the young’uns a nightmare or two. The opening sequence, a flashback to Van Helsing’s showdown with Dracula, features a rather feral vampire bride (biting into an armadillo) as well as an army of decaying corpses, awakened to do the dark lord’s bidding. Another scene (one most kids can relate to) puts a clever new twist on the childhood fear of monsters living in the bedroom closet (the result of which will make you laugh and cower in fright at the same time). Still, the tykes that make up the Monster Squad are a fearless bunch; in a particularly tense scene, a few of them break into the old house where Dracula and his crew are hiding, only to find themselves facing off against the Count and the Werewolf, a sequence that also gives us what is arguably the film’s best line: “Wolfman’s got nards” (a discovery Horace makes at a very opportune time). Like the child actors, those portraying the monsters also do a good job. Duncan Regehr’s Dracula is easily the most malevolent of the bunch (in a heartbreaking scene, the Count takes his frustrations out on the Squad’s beloved clubhouse). As with Laurence Talbot in the 1941 film, the Wolfman in The Monster Squad is a tortured individual who cannot control the beast within (his transformation inside a phone booth is especially well-done). Likewise, Frankenstein’s Monster is every bit the misunderstood character he was in the 1931 version, only this time around he’s found someone willing to accept him as he is (giving us a chance to see what might have been had Karloff’s monster had a friend or two). As for the Gillman and The Mummy, they look as good as they did in their original films. As a fan of old-time horror, I loved how The Monster Squad brought these creatures convincingly to life. Rest assured, however, that even if you’ve never seen a single one of the classics from Universal’s heyday, you’ll still have fun watching this movie. Yes, The Monster Squad is a loving tribute to the past, but it stands on its own just as well. Dave, I had a wonderful introduction to "The Monster Squad" via the cast appearing on a panel at my hometown Horror Hound Weekend 2017! Before then I had never seen this jewel of a monster film for all ages!I had heard of this film before then after buying & watching I totally understood it's cult status! The film was a box office bomb made for 12-mil gross only 3-mil. 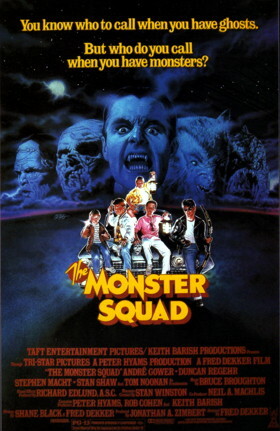 @andregower shed light that #TheMonsterSquad was release a mere 2 weeks after the juggernaut that was "The Lost Boys". Glad to say I think both films will live on in the same breath of being cult classics!